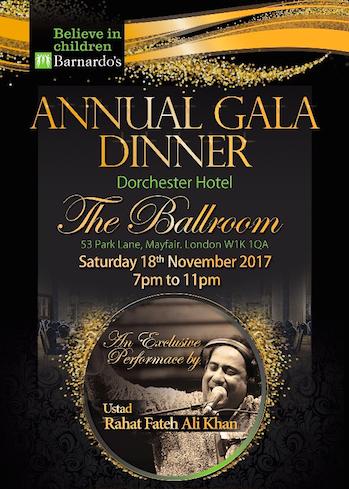 Globally reknowned Qawali singer Ustad Rahat Fateh Ali Khan will perform a special intimate set at London’s world famous Dorchester Hotel this month, as part of a fundraising gala for Barnardo’s. The gala event takes place on Saturday 18th November and will see an array of stars grace the red carpet at the iconic Dorchester Ballroom. The event, conceptualized by PME, will see business leaders and gatekeepers from the British Asian community come together to give back to Barnardo’s, the UK’s largest and most recognized children’s charity. The charity has helped hundreds of thousands of vulnerable children and the unique event offers attendees a chance to join a roster of incredibly talented and dedicated ambassadors and supporters, in an effort to truly give back to children in the UK. Ustad Rahat Fateh Ali Khan, a global ambassador for Barnardo’s, will perform a special 90 minute Qawali set to enthrall attendees. He joins a stellar list of ambassadors for Barnardo’s including Hollywood stars Daniel Craig, Rosamund Pike and Andy Serkis, as well as Bollywood star Salman Khan, who was announced as an ambassadorin September. Celebrity guests expected to attend the gala event include Sanjeev Bhaskar, Meera Syal, Andy Serkis, Nicola Roberts, Jenny Campbell, Lydia Bright and many more.